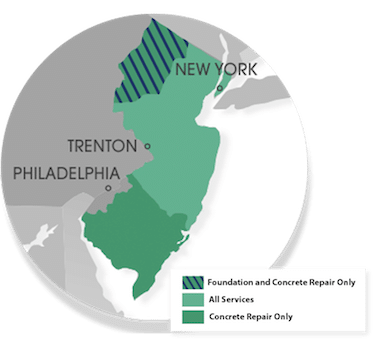 For a FREE no-obligation foundation repair, waterproofing, or concrete leveling estimate in Stanton, NJ, please fill out the form to the right and Quality 1st Basement Systems will contact you shortly. You were highly recommended by a friend for whom you did an installation, so I felt confident in hiring your company. Quality 1st has been serving Stanton residents for over 25 years. We provide you permanent solutions for basements, crawl spaces and foundations. We are known for our quality work and patented basement products. For basement waterproofing, crawl space encapsulation, foundation repair, and concrete lifting we are Stanton's trusted contractor. If you are dealing with flooding, moisture or mold in your basement or crawl space we can solve the problem. We waterproof and protect basements by installing a perimeter drainage system along the interior of the basement. Any water entering is collected and channeled to a high-volume sump pump where it is pumped out and away from your basement. We also install an energy-efficient dehumidifier designed specifically for the basement. By controlling the relative humidity moisture is controlled and mold is prevented. Our basement work in Stanton comes with a transferable lifetime dry-basement warranty. Similar to the basement we also waterproof the crawl space by sealing and encapsulating it with heavy-duty vinyl vapor barrier. If needed a crawl space sump can be installed along with a dehumidifier. Like the basement this controls moisture in the space preventing mold and rot. If the floor above the crawl space is cold we can add proper insulation to make it more comfortable. Instead of a debris filled nest for mold and racoons your crawl space will be a clean dry area you can use for extra storage space! For homeowners dealing with sunken concrete slabs we have simple solution, PolyLEVEL. PolyLEVEL is a polyurethane foam that we inject below the sunken concrete slab. The foam quickly expands to fill the empty space and raise the slab back to its original position. PolyLEVEL is a definite improvement over the mudslurry that most contractors use. Not only is it lighter, but it doesn't wash away, is injected through smaller holes and cures faster. With a dehumidifier, this crawl space will stay dry and not grow any mold when used properly and consistently. Now this crawl space is moisture free and safe from flooding. Snow melted into this crawl space and it was constantly littered with debris. The homeowners needed a solution. We were contacted by a couple who just recently bought their first home. The crawl space needed a lot of work. There were major signs of mold and water seepage. The crawl space vents were open, allowing moisture, humidity and pests inside. Overall the space was very unhealthy and the musty odor coming from the crawl space was making its way up through the air vents into the home. The couple knew that the concerns they had would only grow if they waited longer to repair their crawl space so they called Quality 1st Basements for a free estimate. System Design Specialist, Javier, went out to meet with the homeowners and design a solution that best fit their crawl space needs. Javier recommended a full perimeter waterproofing system to keep the crawl space dry. He also suggested closing the crawl space vents to seal the space off from the outside environment. For this crawl space, preventing water and moisture was a top priority and so Javier also recommended our Moisture Vapor Barrier known as CleanSpace. Our team led by Mario, installed our SmartPipe french drainage system! This is the first custom-engineered french drainage system specifically designed for the crawl space. There are holes on the top and front to allow water seepage to be captured from the soil and surface of the crawl space. The SmartPipe is connected to our one-of-a-kind SmartSump Pump. This system will provide the ultimate protection when it comes to any crawl space. The pump sits inside a liner for protection to prevent failure and malfunction. Our CleanSpace Vapor Barrier is then installed on the floor and walls to block moisture and mold growth. Quality 1st Basements with help from our amazing team was able to provide more then just a solution for this couple. We provided them with peace of mind that they no longer had to worry about their crawl space every time it rained for their investment was now protected.